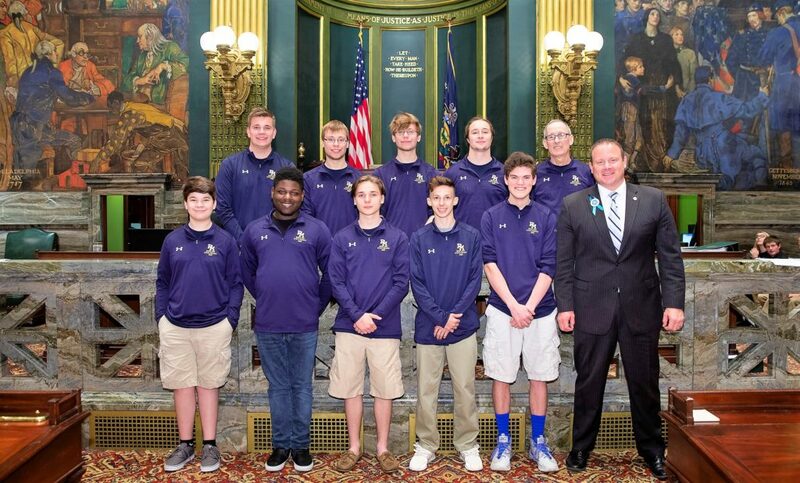 The Penn Manor boys’ bowling team was honored May 22 by members of the state Legislature for earning a third straight state bowling title this season. Team members visited the Senate chambers, where they were honored for winning the state championship in March by defeating Wilson, 2-1. It was the third state title in a row for the bowlers, who beat Ephrata in the title match last year and Conrad Weiser in 2016. No other team in Penn Manor history has won three straight state titles. The Comets are now headed for the national bowling championship June 23-25 in Illinois. Boys’ team members include Dan Mease, Michael Morris, Gavin Davidson, Nick Mease, Jordan Kahler, Jimmy Mahler and Mark Smith. The coaches are Chris Vital, Jordan Wakefield, Mark Smith and Alan Wakefield. Thank you to our state representatives for honoring the team! Members of the Penn Manor bowling team pose with Sen. Scott Martin in the Senate chambers.